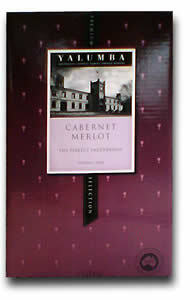 One sip of Yalumba Premium Selection Cabernet Merlot 2009 transported me back to a lovely afternoon in Venice. Unfortunately, the memory was of a cheap, almost undrinkable bulk red wine poured from a stainless steel tank at the cost of a couple of euros for a liter and a half. (Rather than waste a bottle on that stuff, they pour it into a recycled plastic water bottle.) The setting was amazing, the wine, not so much. Here’s the rest of the story. While traveling to Australia on business, I stopped into a “bottle shop” to explore the local retail scene. At least in downtown Sydney, wine seems to be sold in smaller shops vs. the big-box stores that one finds in the states. Recalling that Australia was the birthplace of boxed wine, I was surprised that only one brand, Yalumba, was represented with several varietals. Then again, there were just a few dozen bottled varieties. I picked up a box of the Cab-Merlot, which was nicely packaged in a 2-liter cask. The 2-liter size is nice, as it is compact and will reduce the boredom from having to finish a four-bottle equivalent 3-liter box. Onto the wine itself… The earthy berry nose was weak and not promising. The first sip was a disappointment. A harsh off-note overwhelms what might be reasonable blackberry and cinnamon flavors and a not unpleasant tannic finish. The effect was rather prune-like. The wine seemed to improve slightly with extended breathing, but not enough to merit actually buying the stuff again. It’s odd that one can find more, and better, Australian box wines in the States than in downtown Sydney. Of course, the shop that I visited was quite small. Perhaps on my next trip I can arrange an expedition to a bigger store. This entry was posted in Box Wines, Cabernet Sauvignon, Merlot, Red Wines and tagged australia, blend, yalumba on October 20, 2010 by Roger.